Why go vegan? To be healthier! Studies showed that vegans have significantly lower BMI, lower blood cholesterol, and a lower risk of cardiovascular disease. A balanced vegan diet is richer in dietary fibre, higher in potassium and magnesium, folic acid, and the antioxidant vitamins C and E. The health benefits are obvious, but as with any restricted diet, the keyword is balance, since an imbalanced selection of foods can cause nutrient deficiencies and health issues. Need a recipe? 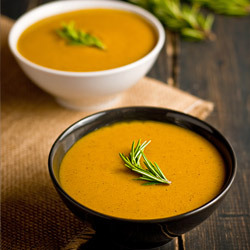 Since butternut squash is in season, why not try this Roasted Butternut Squash & Pear Soup? It is a no-fuss savoury-sweet soup for winter days like this. Lightly oil a glass baking dish or roasting pan with olive oil and add diced butternut squash. Drizzle a little olive oil on top, season with salt and pepper. Roast butternut squash in preheated oven for about 20 minutes, or until soft. Heat a stock pot or Dutch oven over medium-high heat, add 1 tbsp olive oil and diced onions. Cook onions for 3-4 minutes or until soft, add garlic and cook for 2 minutes. Add diced pears and cook for 2-3 minutes. Transfer roasted butternut squash to stock pot and add cinnamon, cumin, a little salt and pepper, and cook for 1-2 minutes to release the aromatic spice flavors. Add vegetable broth and rosemary, bring to a boil, reduce heat, and simmer for 10-15 minutes. Remove woody rosemary stem if present. Pour entire contents into blender if it’s large enough, if not you can do this in batches. You can also use an immersion blender if you have one. The idea is to blend this soup very well, we want a very smooth consistency, not chunky. Serve immediately.